Platinum Dunes, the Michael Bay-owned production studio responsible for tarting up the Friday the 13th franchise with their poorly-received 2009 outing of the same name, have this time turned their attentions to infamous undead kiddie-fiddler Freddy Krueger. Boasting a more realistic makeup job and a spooky digitally-altered voice this time around, the perpetually scruffy killer is busily haunting the dreams of a whole new generation of unsuspecting, good-looking young suburbanites. The vapid twits scream and flounder just like they did in the eighties, trying desperately to keep themselves awake when they realise the sweater-clad cad only attacks them in their dreams, but by the time they realise there’s a common link uniting them viewers will likely be numb with tedium. Both a ‘reboot’ of the series and a loose remake of Wes Craven’s 1984 original, A Nightmare On Elm Street comes across as a curiously inert affair. Apparently director Samuel Bayer had to be persuaded by old crony Michael Bay to even take on the project, and it isn’t hard to see why: the budget might have increased and the special effects improved, but even the presence of computer-generated wizardry and a darker, more nuanced villain can’t disguise the fact that this addition to the series offers little that hasn’t already been seen in the eight films which preceded it. The characters are mostly interchangeable cardboard cutouts – one exchange between Kris Fowles (Katie Cassidy) and her mother finds both actresses so disinterested as to appear in their throes of a narcoleptic episode, and it is difficult not to follow suit. Only the excellent Rooney Mara, soon to be portraying Lisbeth Salander in the US remake of The Girl With the Dragon Tattoo, gives anything approaching a committed performance, but ultimately she fails to inject more than a modicum of watchability into this ugly, rotten carcass of a concept. No complaints here. The film is presented in an impeccable 2:40:1, 1080p transfer, with a DTS-HD English 5.1 Master Audio track. Other languages featured are Castilian Spanish, Italian, French, German and Thai, all in DD 5.1 surround. A 2.0 English Audio Descriptive Service is provided, as are subs in English and no less than 15 other languages. Warner Brothers certainly haven’t skimped on providing value for money. The Blu-ray Combo Pack contains the 1080p, DVD and Digital Copy (for watching on iPods and the like) versions of the film – three formats for around thirty bucks isn’t too shabby, and it’s a nice incentive to those presently sticking with DVD but thinking about upgrading to HD in the future. 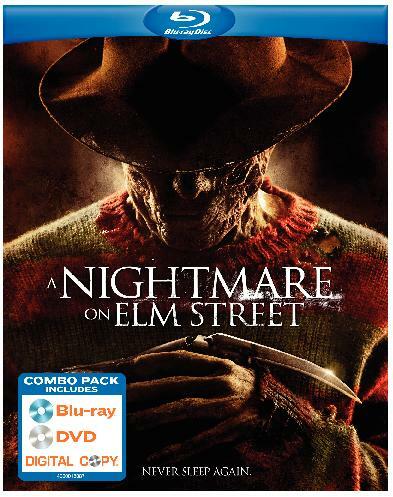 Included as bonus features are a fairly standard, self-congratulatory 14-minute ‘Freddy Krueger Reborn’ Featurette that includes behind the scenes footage and interviews with cast and crew; something called ‘WB’ Maniacal Movie Mode, which provided such useful titbits as ‘in certain scenes you can literally see the flesh bubbling on Krueger’s face;’ ‘Focus Points’, a series of short featurettes on makeup, costumes, special effects and the like, two Deleted Scenes and an Alternate Ending. The lack of a Director’s Commentary is a glaring omission, but fans of the film (and its $130 million worldwide box office gross suggests there are plenty of those) will presumably not be disappointed by this bumper crop.